This is Thin-Lite's Premium line of low voltage d.c. LED lighting. back down to 28 volts. (no-switch special order models can not be dimmed) to reduce light output. making them ideal for heavy duty truck and equipment installations. 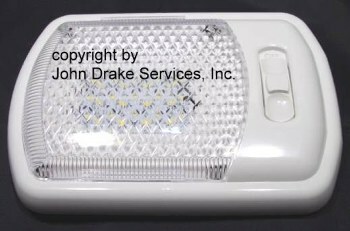 Many on and off cycles do not affect these led lights as they would a fluorescent light. shacks due to their high light output and low power draw. restrictions on generators - these are ideal for reducing your power consumption. you will need to lug around less batteries for your fishing trip. Now we are using two LED139/2P's in the shop - they have not been turned off since April of 2017. Thin-Lite has come out with a new line of budget led lights. FS series and will have a link to the new model. The led lumen ratings given are design lumens. 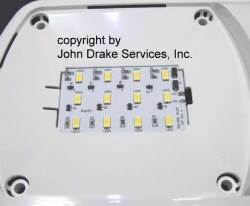 Uses the same housing as the fluorescent model # TL-112 and P212 lights. Dimensions: 12.25" by 5.5" by 1". 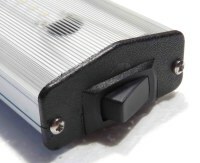 Amp draw of .24 to .80 amps (2.88 to 9.66 watts), lumen output of 480 to 1600 lumens. Note: the fluorescent mod. 112 draws 1.4 amps and outputs 800 lumens. Dimensions: 12.25" by 5.5" by 1" with a built-in momentary switch on one end. 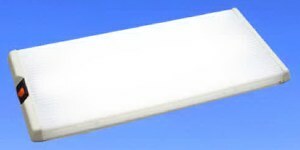 The color of the led's in this fixture are 4000 degrees Kelvin - cool white (No Color). will have a completely different light output and coverage - even when dimmed down. This model operates on 8 to 30 volts d.c. and can be dimmed using the on/off switch. Made in the U.S.A. by Thin-Lite Corp. Available either with or without the wood strip on the lens. Please choose lens type before adding to shopping cart. Model # LED112FS (indoor light) economy model. Same housing and lens as the Premium model. The LED's are 6000K - Daylight color with slight blue tinge. Operates on 12 volt d.c. only. Choose lens before adding to cart. Plain White lens - No Trim Lens with fake wood strip. Uses the same housing as the fluorescent model # TL-115 and P215 lights. Dimensions: 18" by 4" by 1.419". Amp draw of 0.18 to 0.6 amps (2.16 to 7.2 watts), lumen output of 360 to 1200 lumens. Note: the fluorescent mod. 115 draws 1.3 amps and outputs 825 lumens. A great light for camper shells and small portable shelters. We no longer stock this light but can special order one for you. Available in either the Premium or Economy model. Uses the same housing as the fluorescent model # TL-116 and P216 lights. Dimensions: 18" by 5.625" by 1.75". Amp draw of 0.4 to 1.25 amps (4.32 to 14.4 watts), lumen output of 720 to 2400 lumens. Note: the fluorescent mod. 116 draws 2.2 amps and outputs 1650 lumens. Also available in a 12 volt d.c. only / non-dimmable model at a reduced price. Please choose lens type before adding to cart. With wood grain trim. No wood grain trim. Model # LED116FS (indoor light) economy model. Model # LED130P indoor light. This is Thin-Lite's LED version of the popular mod. 130 fluorescent light. End mounted momentary rocker switch. Dimensions: 12" long by 5.5.375" wide by 1.75" high. Amp draw of 0.24 to 0.80 amps (2.88 to 9.60 watts), lumen output of 480 to 1600 lumens. Note: the fluorescent mod. 130 draws 1.4 amps and outputs 800 lumens. We no longer stock this model but can special order them for you. This is Thin-Lite's LED version of the popular mod. 134 fluorescent light. Note: the fluorescent mod. 134 draws 2.2 amps and outputs 1650 lumens. Uses the same housing as the fluorescent model # TL-162 and P262 lights. Dimensions: 12.875" by 3.80" by 2.75". Note: the fluorescent mod. 162 draws 1.4 amps and outputs 800 lumens. These make an excellent engine room light in boats with either a 12 or 24 volt electrical system. Available either with a clear or amber lens. Please enter clear or amber lens before adding to shopping cart. Model # LED162FS (outdoor light) economy model. Available either a clear or amber lens. Uses the same housing as the fluorescent model # TL-163 and P263 lights. Dimensions: 18.5" by 3.80" by 2.75". Amp draw of 0.18 to 0.60 amps (2.16 to 7.20 watts), lumen output of 360 to 1200 lumens. Note: the fluorescent mod. 163 draws 1.3 amps and outputs 800 lumens. This is also a great replacement for engine room 24 & 28 volt lights in SeaRay boats. wires coming out of the back of the LED fixture, the P263CSRNS and the P263CSRNS28. Please choose lens before adding to shopping cart. Model # LED163FS (outdoor light) economy model. Available with either clear or amber lens. twice the number of leds. This is a great replacement for engine room 24 volt lights in SeaRay boats. Due to its high light output it makes an excellent area light when mounted on a vertical surface. Amp draw of 0.36 to 1.2 amps (4.32 to 14.4 watts), lumen output of 720 to 2400 design lumens. Dimensions: 7.75" by 3.80" by 2.75". Amp draw of 0.1 to 0.40 amps (1.44 to 4.8 watts), lumen output of 240 to 800 lumens. Because of their size and light output, these have a wide variety of applications. Uses the same housing as the fluorescent model # TL-167 and P267 lights. Dimensions: 36.5" by 3.80" by 2.75". For area security lighting, these are hard to beat. twenty feet deep for area illumination) and about twenty feet wide. Note: the fluorescent mod. 167 draws 2.1 amps and outputs 2180 lumens. Dimensions: 7-5/16" long by 4-9/16" wide by 1" front to back. Measured amp draw (using a clamp on amp meter) at 12.62 volts is 0.31 amp. cycles to not affect the life span. These are becoming very popular for use in recreational vehicles with basements. Their shallow depth works well in cramped space applications. as for use as a dome light. This model does NOT have the dimming feature. This model operates on 12 to 14 volts d.c. This light is limited to stock on hand. Dimensions: 11-9/16" long by 4-9/16" wide by 1" front to back. Measured amp draw (using a clamp on amp meter) at 12.48 volts is 0.66 amp. Their shallow depth works well in cramped space applications such as in tent trailers. The sliding switch has three positions: off, one led cluster on, both led clusters on. This is a new design by Thin-Lite for an extremely thin high output led light. Uses the front shell and lens of the 762 recessed fixture but has a flat back. This allows the light to be surface mounted (no cut out in the ceiling). Dimensions: 16-1/8" long by 7-3/8" wide by 3/4" thick. Amp draw of 0.24 to 0.80 amps (2.89 to 9.60 watts), lumen output of 480 to 1600 lumens. These were designed for locations where a lot of light is needed but there is very little headroom. Ideal for use as an undercabinet light as well as for use in camper shells and low ceilings. Has 48 leds and weighs about 14-1/2 ounces. wood, wood panel or metal. installation which would void the warranty. Uses the front shell and lens of the 766 recessed fixture but has a flat back. Dimensions: 21-7/8" long by 7-3/8" wide by 3/4" thick. Amp draw of 0.40 to 1.25 amps (4.32 to 14.4 watts), lumen output of 720 to 2400 lumens. For use in locations where a lot of light is needed but there is very little headroom. camper shells and low ceilings. Has 72 leds and weighs about 1 pound 4 ounces. such as wood, wood panel or metal. damaged during installation which would void the warranty. This is Thin-Lite's LED version of the popular fluorescent model 622 and P2622. It uses the same housing as the mod. 622. Dimensions: 13.95" by 5.56" by 1.51". and the NBX fluorescent draws 1.5 amps and outputs 1500 lumens. as well as RV and alternative energy applications. Model # LED622FS (indoor light) economy model. Please note - the housing is slightly off-white. This is Thin-Lite's LED version of the popular fluorescent model 626 and P2626 lights. It uses the same housing as the mod. 626. Dimensions: 19.67" by 5.56" by 1.51". and the NBX (Biaxial tube) fluorescent draws 2.3 amps and outputs 3000 lumens. Model # LED626FS (indoor light) economy model. This is Thin-Lite's LED version of the popular fluorescent model 656. It uses the same housing as the mod. 656. Dimensions: 22.652" by 7.30" by 1.51". Amp draw of 0.40 to 1.25 amps (4.32 to 14.40 watts), lumen output of 720 to 2880 lumens. Note: the standard fluorescent mod. 656 draws 2.2 amps and outputs 1650 lumens. LED716XLP with the clear prismatic lens for maximum light output. As with their other led lights, this operates on either 12 or 24 volts d.c. It uses the same housing as the mod. 716XL. Note: the standard fluorescent mod. 716XL draws 2.2 amps and outputs 1650 lumens. Model # LED732P indoor led light. As with their other premium led lights, this operates on either 12 or 24 volts d.c. It uses the same housing as the fluorescent mod. 732. Amp draw of 0.24 to 0.80 amps (2.88 to 9.6 watts), lumen output of 480 to 1600 lumens. Note: the standard fluorescent mod. 732 draws 1.4 amps and outputs 800 lumens. Model LED736P with plain white lens. Model LED736XLP with the clear prismatic lens. It uses the same housing as the fluorescent mod. 736. Note: the standard fluorescent mod. 736 draws 2.2 amps and outputs 1650 lumens. on the inside) lens or with the off white translucent lens. Model # LED736FS (indoor light) economy model. Available with either a standard white lens or clear Prismatic lens. This is Thin-Lite's LED version of the popular fluorescent model 742 recessed light. Uses the same housing as the fluorescent model 742 - for use with shallow ceilings. Note: the fluorescent mod. 742 draws 1.4 amps and outputs 800 lumens. This is Thin-Lite's LED version of the popular fluorescent model 746 recessed light. Uses the same housing as the fluorescent model 746 - for use with shallow ceilings. Note: the fluorescent mod. 746 draws 2.2 amps and outputs 1650 lumens. Model # LED746FS (indoor light) economy model. This is Thin-Lite's LED version of the popular fluorescent model 762 recessed light. Uses the same housing as the fluorescent model 762 - for use with shallow ceilings. Note: the fluorescent mod. 762 draws 1.4 amps and outputs 800 lumens. This is Thin-Lite's LED version of the popular fluorescent model 766 recessed light. Uses the same housing as the fluorescent model 766 - for use with shallow ceilings. Note: the fluorescent mod. 766 draws 2.2 amps and outputs 1650 lumens. Model # LED766FS (indoor light) economy model. Overall Dimensions : 13.25L x 2.5W x 1.25"
This is Thin-Lite's LED version of the popular fluorescent model 171 and P271. Has a momentary push button on one end as shown. Dimensions: 18.25" by 2.50" by 1.25". Amp draw of 0.18 to 0.60 amps (2.16 to 7.20 watts), lumen output of 315 to 1050 lumens. Note: the fluorescent mod. 171 draws 0.8 amps and outputs 400 lumens. 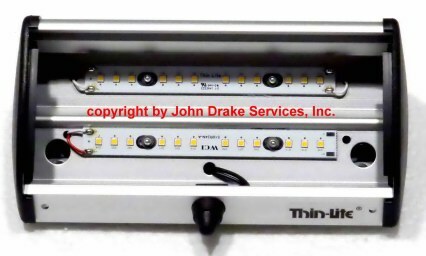 This is Thin-Lite's LED shortened version of the popular fluorescent model 173. Dimensions: 23.25" long by 2.50" wide by 1.25" thick. Being long and narrow, these cast an even light over a fairly large area. Note: the fluorescent mod. 173 draws 1.1 amps and outputs 850 lumens. This is Thin-Lite's LED lengthened version of the popular fluorescent model P173. Dimensions: 33.25" long by 2.50" wide by 1.25" thick. Well suited for alternative energy setups as well as in camper shells. Amp draw of 0.40 to 1.25 amps (4.32 to 14.40 watts), lumen output of 720 to 2400 lumens. Note: the fluorescent mod. P173 draws 1.1 amps and outputs 850 lumens. We no longer stock this model, but can order one for you. 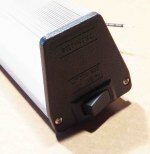 This is Thin-Lite's LED shortened version of the popular fluorescent model P174. Dimensions: 43.25" long by 2.50" wide by 1.25" thick. Amp draw of 0.48 to 1.60 amps (5.76 to 19.20 watts), lumen output of 960 to 3200 lumens. Note: the fluorescent mod. P174 draws 2.0 amps and outputs 1700 lumens. Dimensions: 48.25" long by 2.50" wide by 1.25" thick. Amp draw of 0.48 to 1.60 amps (5.76 to 19.20 watts), lumen output of 960 to 3840 lumens. 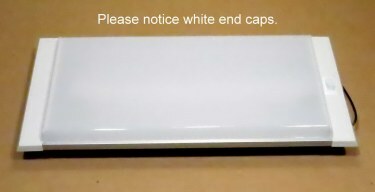 Has black end caps as shown. 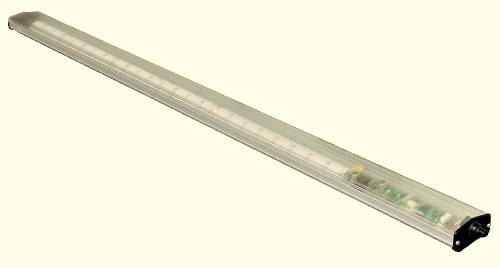 This is Thin-Lite's LED longer version of the popular fluorescent models 191 and P291. This model uses the same housing as the 191 but is 3/4" longer. Has a momentary rocker switch on one end. Dimensions: 13.25" by 2.50" by 2.50". Amp draw of 0.12 to 0.40 amps (1.44 to 4.80 watts), lumen output of 240 to 800 lumens. Note: the fluorescent mod. 191 draws 0.8 amps and outputs 400 lumens. This is Thin-Lite's LED shorter version of the popular fluorescent model 193 and P293. This model uses the same housing as the 193 but is 5-3/16" shorter. Dimensions: 18-7/16" (housing) and 18-3/4" (including the switch) by 2.50" by 2.50". Note: the fluorescent mod. 193 draws 1.3 amps and outputs 870 lumens. This is Thin-Lite's LED version of the popular fluorescent model 195 and P295. Has a momentary rocker switch on one end as shown. Dimensions: 23.25" by 2.50" by 2.50". Note: the fluorescent mod. 195 draws 1.5 amps and outputs 1225 lumens. 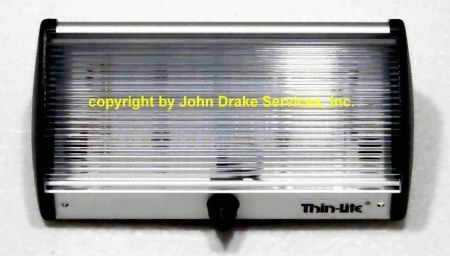 This is Thin-Lite's LED version of the popular fluorescent model 197 and P297 lights. Dimensions: 33.25" by 2.50" by 2.50". Note: the fluorescent mod. 197 draws 2.1 amps and outputs 2175 lumens. light source closer to a table or floor, these work very well due to their heavy extruded housing. This model has momentary Rocker Switch, unlike the original fluorescent version which does NOT have a switch . Dimensions: 43.25" by 2.50" by 2.50". Amp draw of 0.48 to 1.60 amps (5.76 to 19.2 watts), lumen output of 960 to 3200 lumens. Note: the fluorescent mod. P1954BK draws 2.3 amps and outputs 2850 lumens. These are very popular for use in tool trucks and service trucks. its light output in a single round source. area for more even coverage. Back to Top Back to instock models.